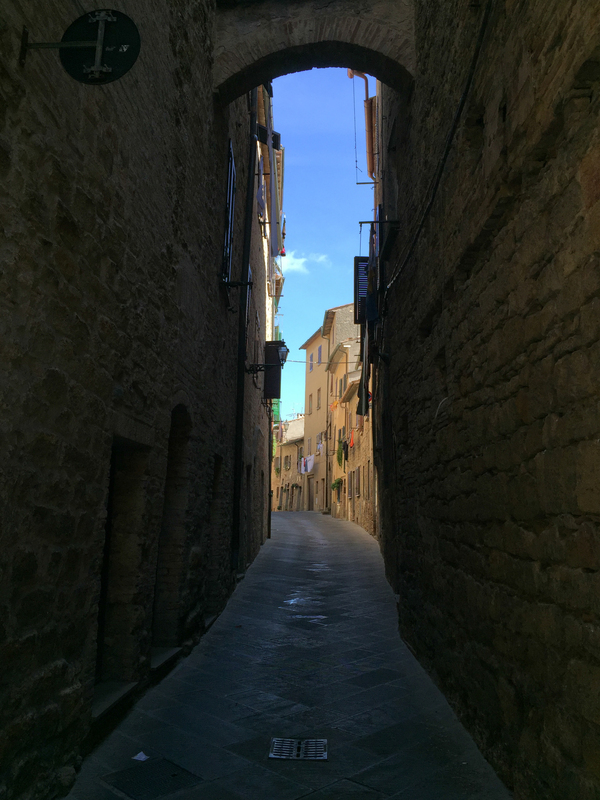 Our first outing was to Volterra, a medieval walled city about an hour away. My dad had rented a little van, and he was our driver. 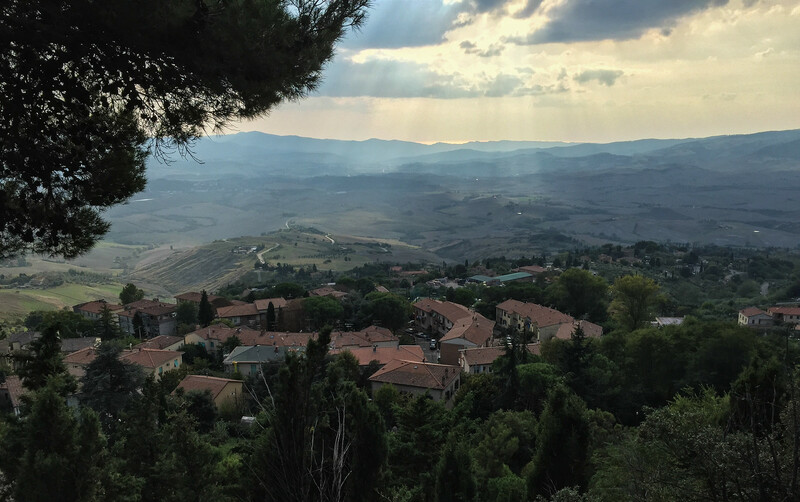 He is a hardier soul than I am; the narrow lanes, twisting turning mountain routes, blind hairpin curves with a high cliff on one side and a steep plunge on the other, and the wild passing habits of Italian drivers kept me white-knuckled the whole ride. In many of the old walled cities, tourists aren’t allowed to drive within the city walls, which seems a very reasonable idea, since these cities were definitely not built for auto traffic. So we parked down the hill and walked up a bit. 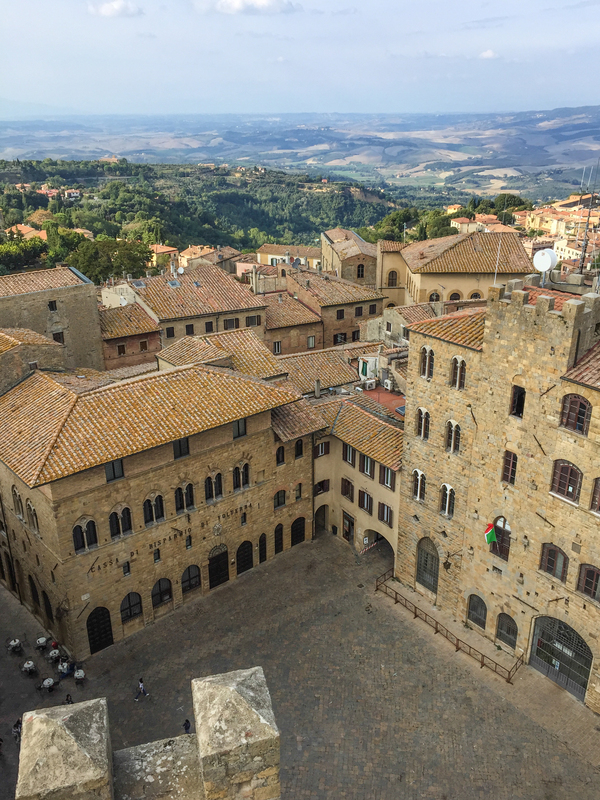 Tuscany has a wonderful collection of medieval hill cities; they built on hilltops both for security and because of the threat of malaria – hilltops are relatively mosquito-free. 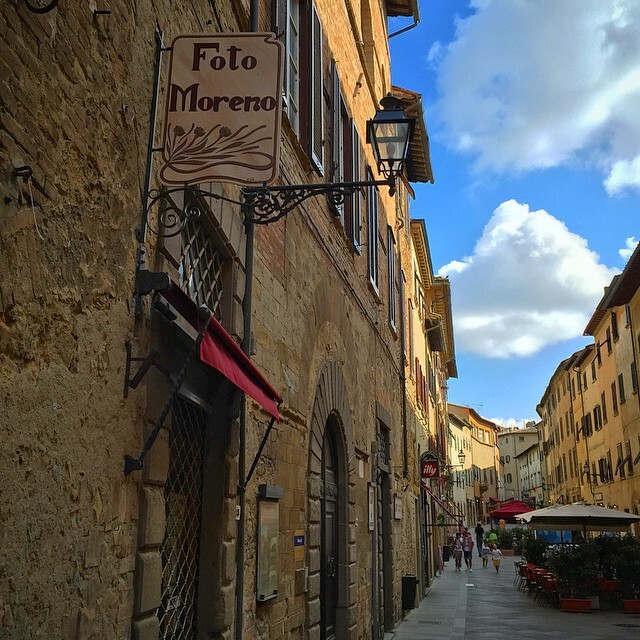 By the end of the week we’d seen a wonderful handful of medieval Tuscan towns and cities, and gotten a bit used to the layout and the depth of history – but this was the first, and I was feeling so amazed by everything! The giant city walls, the city gates, the view out over rooftops, hills and farms outside, and the dark, narrow streets bordered by high walls inside the city. 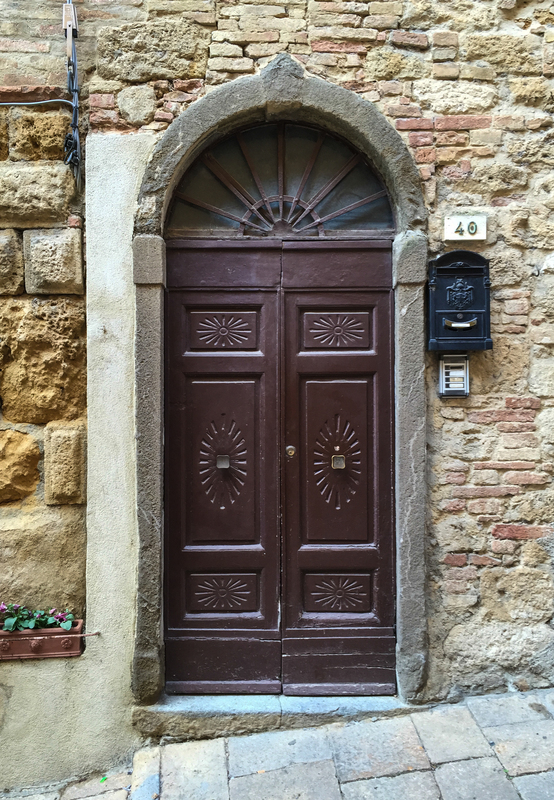 There’s an intimate feeling inside the city, as all the buildings are so crowded together and open windows and doors allow glimpses inside peoples’ houses and apartments. 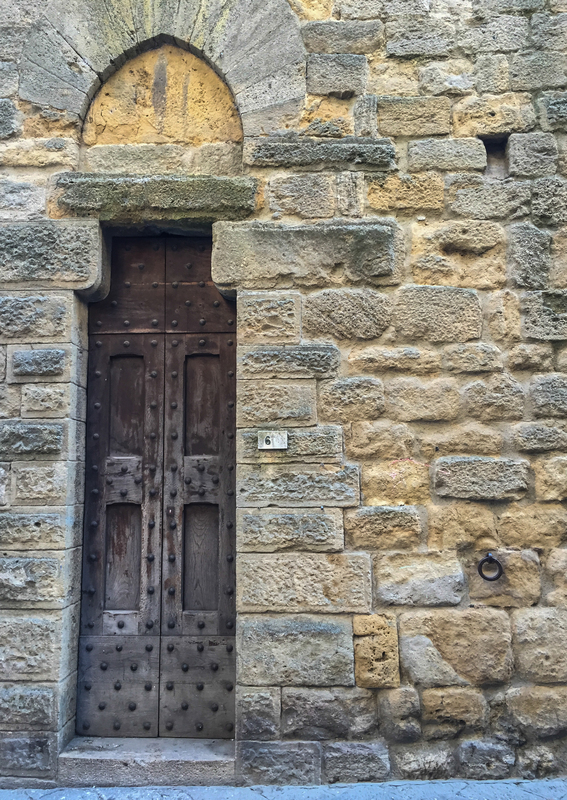 I got kind of stuck on photographing doors! 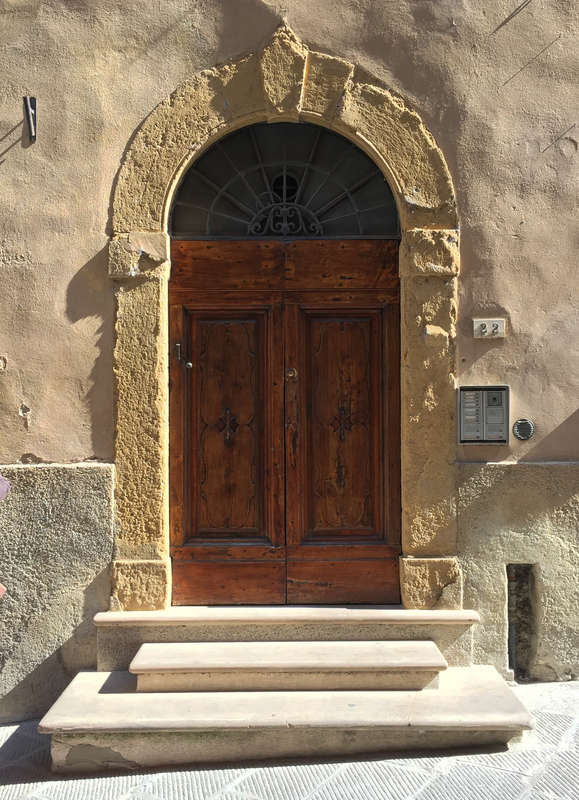 All the arched doors and windows are so handsome, and the varied-but-same-ness was so compelling, I couldn’t stop snapping doors all day long. 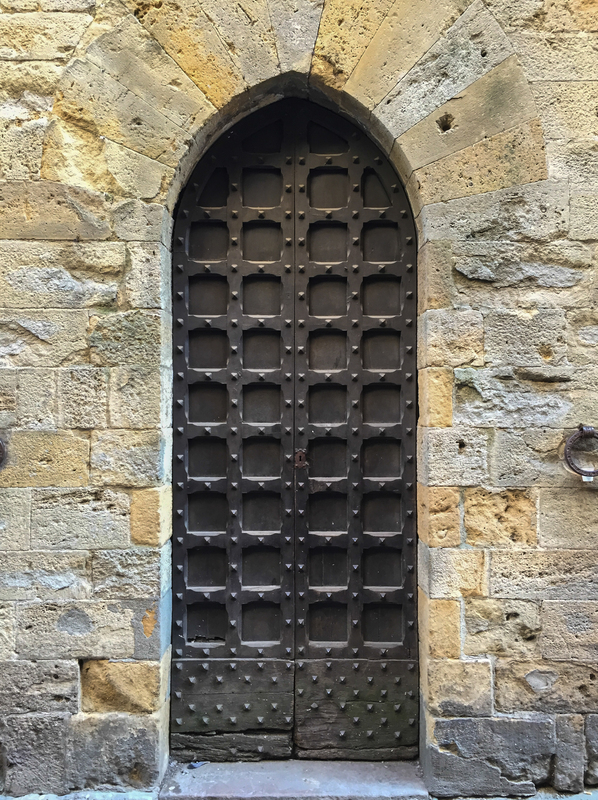 In many cases the doorways and windows are extra interesting because you can see how they had been built and covered over and rebuilt, so it was kind of a visual history of the building and the city. 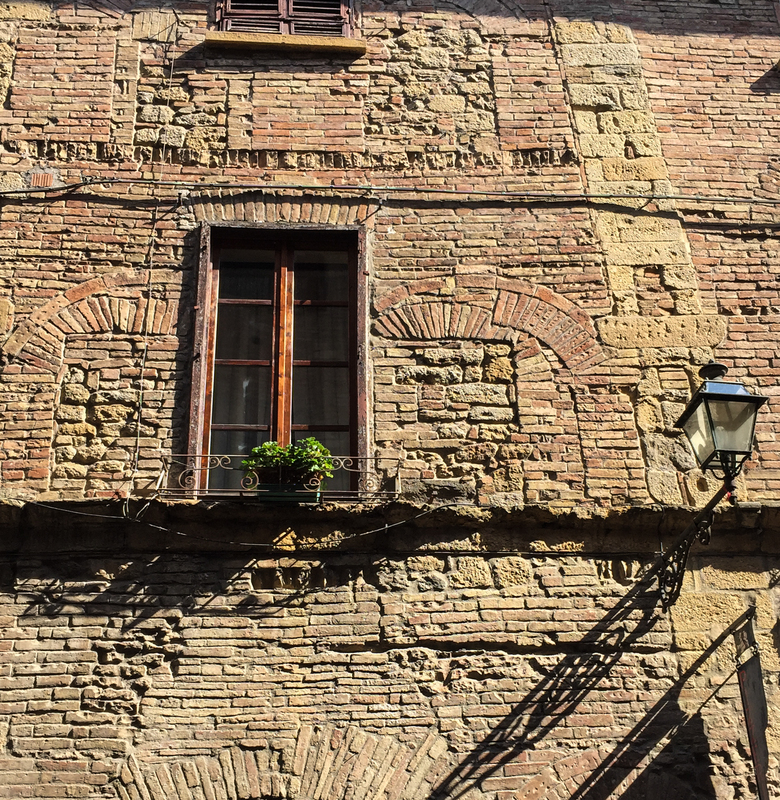 Many of the buildings had been there for hundreds and hundreds of years and had been altered and reworked but never demolished and rebuilt – so fascinating for those of us from a relatively new country where we are so quick to knock down old things and replace them with new. We strolled around the city and saw the remains of a Roman theater, which was cool, though kind of more exciting in theory than in reality. A lot of grass and worn stones in an amphitheater shape (though it’d probably be more interesting for me if I remembered more about Roman culture & history and knew more of the context and the story of the site). I really can’t wrap my mind around how incredibly ancient this is. My entire lifetime x 50, and then some more. 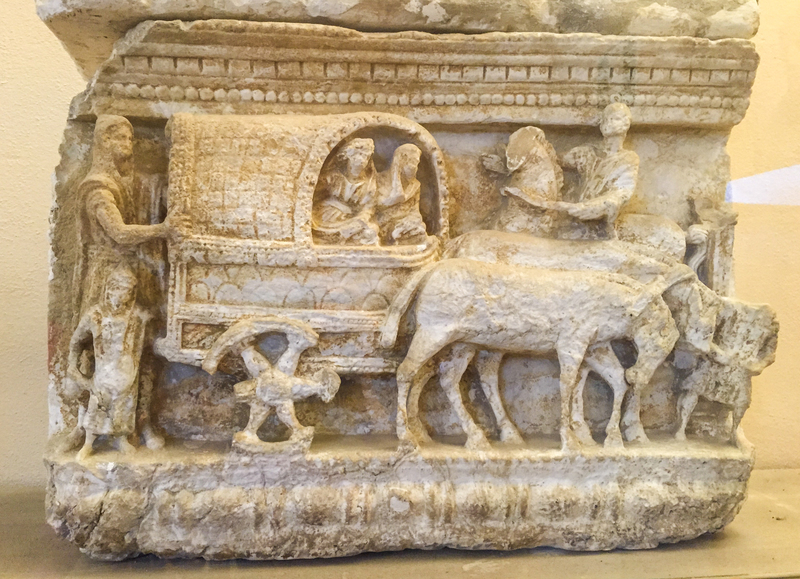 And before the Romans came to Volterra, the Etruscans were there first. 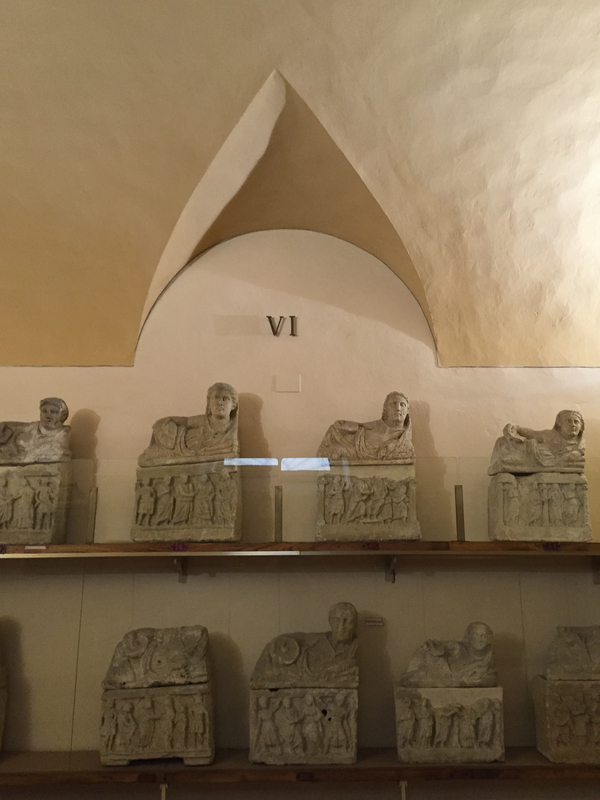 We spent hours in the Etruscan museum there. 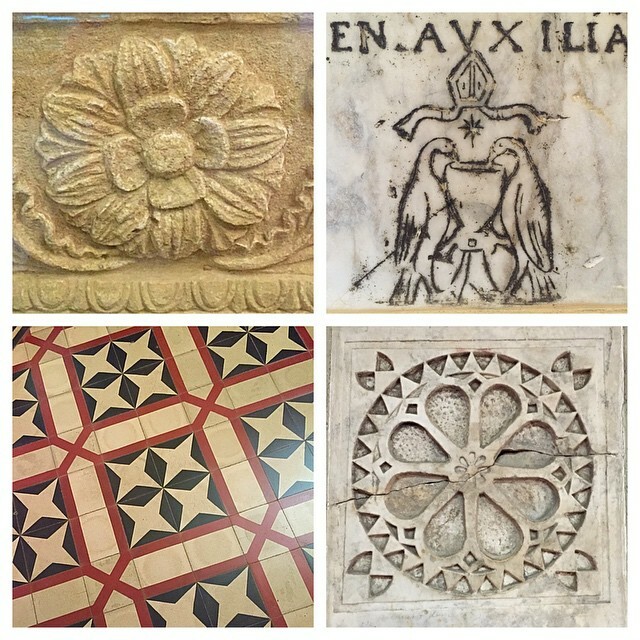 It seemed to contain artifacts from all over the region of Tuscany (which is so named for the Etruscans; this was their core territory). 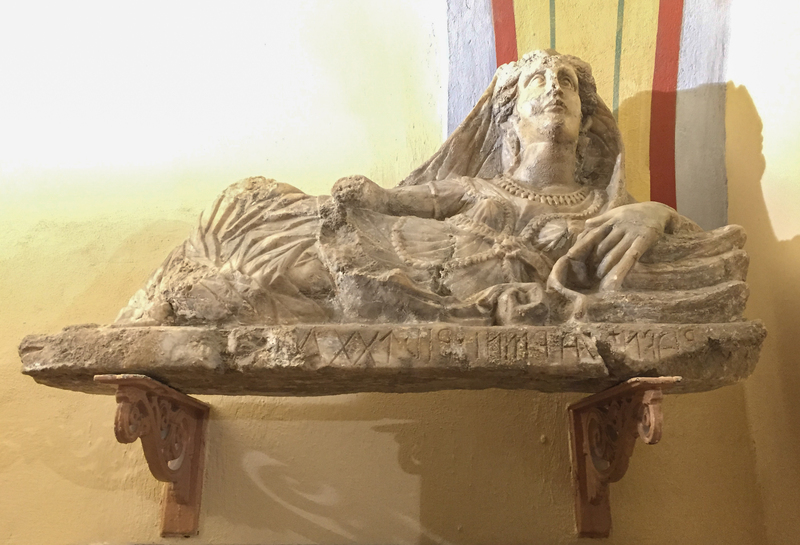 Most of what remains is their elaborate tombs, with wonderful carved alabaster statues of the deceased. 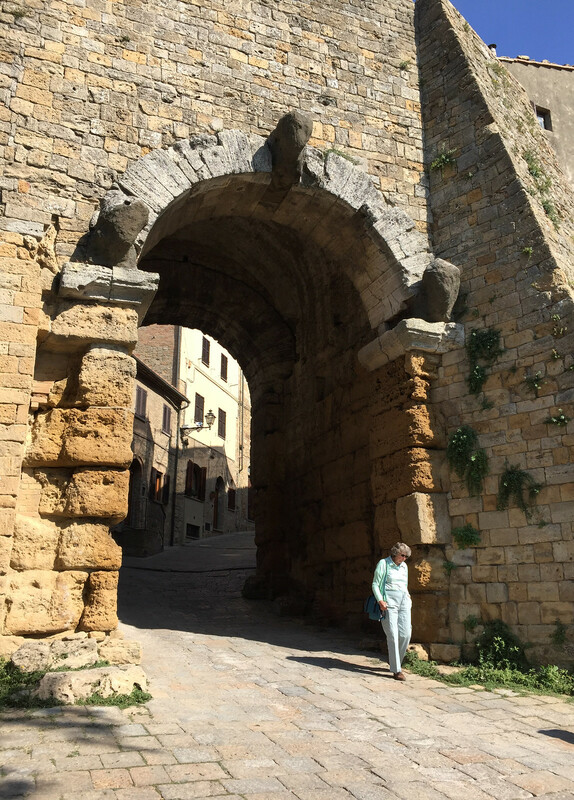 Some folks stopped for a rest in the city square, but my sisters and I went on to see one more sight, the Palazzo dei Priori, the city hall of Volterra. It’s wonderfully ornate inside, it looks like a museum but it’s where they still conduct the city business. 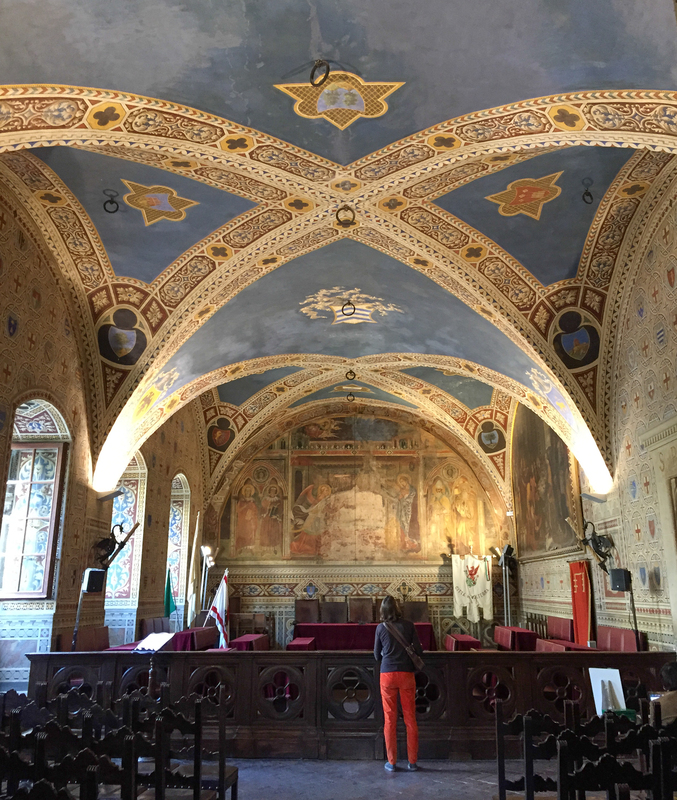 The walls and arching ceilings are covered in intricately patterned frescoes and lit by amazing black, dragon-shaped wall sconces. 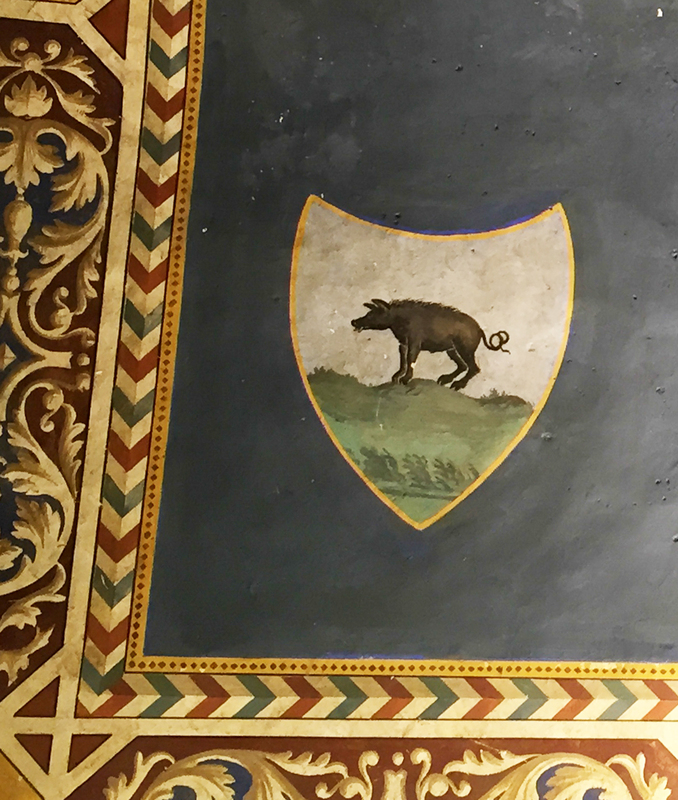 One of the fresco details was a shield with an illustration of the local wild boars, the same ones that we glimpsed in the woods by our farmhouse. The building has a bell tower, and after climbing a few flights of stairs we were able to head up into the bell tower and climb some more stairs (very steep and narrow, with open treads) up and up, then squeeze past the great old bell itself! 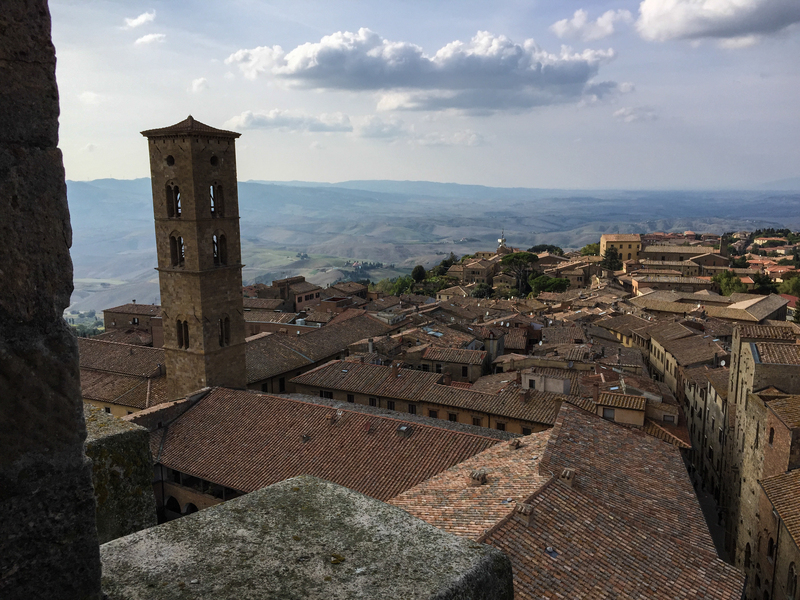 and then, turning sideways to get up the last and skinniest set of stairs, we were rewarded with views across the whole city and all the towns and countryside and mountains beyond. It felt like a bit of an adventure just getting up in the bell tower and then the view of the rooftops was such a delight. I could’ve stayed there looking out all afternoon. But, according the signs, visitors have to hurry down from the bell tower before the bell rings again, which it does every 15 minutes! I’m sure if we’d been anywhere near that bell when it rang, it would’ve deafened us and probably knocked us right back down all those steps. On the way back, we stopped to perch for a minute on the city wall and look out across the land below.